Wind and rain conspired to set loose a gigantic inflatable piece of installation art, turning it into a kind of impromptu performance piece for drivers and bystanders as one (very big) red balloon rolled by. In some regards, the resulting viral sensation has taken on a life of its own, extending the reach of the sculpture far beyond its target audience. 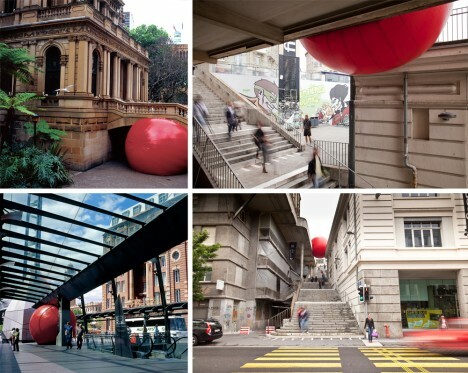 Designed to be a source of urban interaction, the RedBall was in the process of being wedged between two downtown businesses before being redirected by forces of nature. Museum staff, installation participants and a handful of bystanders chased the recently-liberated sphere down the streets, eventually catching, deflating and returning it to the installation site. Instagram user jeremy419 happened to catch much of the action from atop a nearby building. Meanwhile, a hacked version of video puts a fresh tomato-style spin on this unexpectedly interactive work of art. Despite its size (15 feet in diameter), the ball weighs only 250 pounds, minimizing its potential for damage to one bent street sign – quite tame compared to rounded corporate art sculpture set loose in Fight Club as part of Project Mayhem.